Do You Take This Debt, for Better or Worse? When you get married, you merge lives with another person. You promise you’ll stick together for better or worse, richer or poorer, in sickness and in health. But your vows don’t mention what happens to pre-existing and marital debt. Are you liable for your beloved’s debt load? Perhaps. The question is: Was the debt incurred before or after the wedding vows? 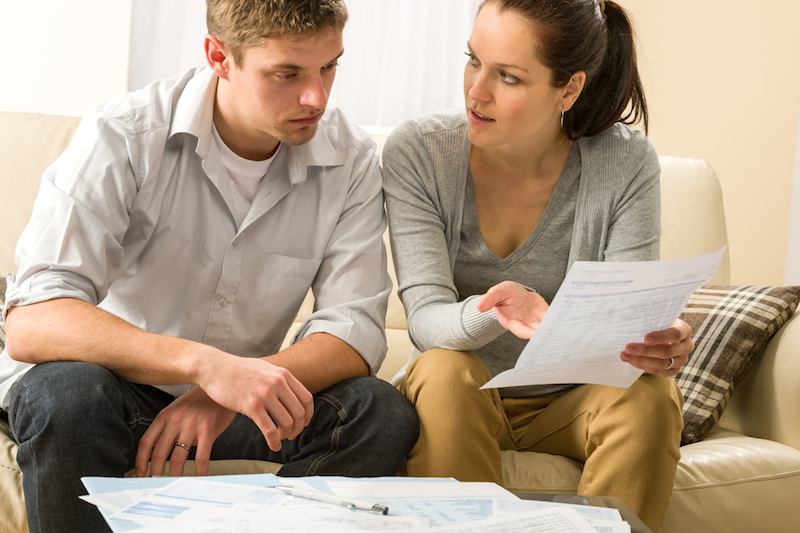 My spouse came into the marriage with debt — is it my responsibility? No, and your spouse won’t be financially liable for your pre-existing debt, either. Legally, debt brought into marriage is typically the responsibility of the person who incurred it. Some married couples choose to pay off separate debts together, but in the event of a divorce, remaining debt brought into the marriage will be owed by the spouse who incurred it. Also, if the couple chooses not to make payments on a certain debt, it will only affect the credit score of the spouse who brought it into the marriage. My spouse incurred debt after we got married — is it my responsibility? Unless both of your names are on the debt, it will only affect the credit score of the spouse who incurred it. Debt payments are the responsibility of the person whose name is on the application, at least until divorce, death or annulment. Then, whether or not both spouses owe is based on the rules of the state — either community property or common law. Community property: In the event of death, divorce or annulment, community-property states divide property and debts between the two spouses, regardless of who acquired them. As of August 2016, there are nine community-property states (Arizona, California, Idaho, Louisiana, Nevada, New Mexico, Texas, Washington and Wisconsin). Also, Alaska allows spouses to opt for a community-property arrangement if desired. Along with this, if your spouse is insolvent, his or her creditors can go after your assets in a community-property state. And if one spouse files Chapter 7 bankruptcy, all eligible debts of both spouses will be discharged. Income and property may also be split, but community-property states do allow gifts and inheritances to one spouse to be solely owned by that person. If you live in a community-property state and don’t want to be liable for your spouse’s financial decisions during marriage, you can draw up a pre- or post-nuptial agreement. Common law: Any state that isn’t considered community property is considered common law. In common-law states, only debts that benefit the marriage or debts with both spouses’ names on them will be considered joint. Business debt or car debt with one spouse’s name on it will go to the person who incurred it. If kept separate, income and property are treated separately in case of divorce. Also, any assets with only one spouse’s name on them will belong to that spouse. Creditors of a spouse can seize assets of the other spouse, but only if the debt was incurred jointly or for family necessities. In most common-law states, the creditor can only take up to half of the money in a joint account. As always, it’s a good idea to know your rights. Find out whether you’re in a community-property or common-law state to understand your financial responsibilities in the case of divorce. Hopefully, you won’t have to worry about it, but it’s nice information to have. This article updated Aug. 24, 2016. It originally published May 8, 2014.